At a wetland restoration course I attended this summer, I met someone from Hamilton Conservation who mentioned an interesting project to protect turtle habitat and nests. This was during a day-trip where the class saw some man-made turtle basking and nesting sites that South Nation Conservation had implemented. They were along Chippenhook Creek (where it crosses Skakum Road). The Hamilton project took it one step further, in that volunteers monitored the nesting sites and protected them against predators during the summer and then helped the baby turtles when they are hatching. - Turtles move from their wintering sites in late May and their peak nesting period is mid-June. - Dundas Turtle Watch volunteers identify, monitor and rescue turtles at risk from traffic. Cootes Paradise (where this work is being done) is a remnant marsh near McMaster. - Female turtles of some species take approximately 16 years to reach breeding maturity so the protection of females of breeding age is essential to their survival. - Volunteers also protect nests from predation wherever possible - this is done by identifying and marking sites and also putting grates or chicken wire on top of the nest. - Volunteer work begin in late May, with a summer break usually in July and part of August. Then the monitoring starts again as the eggs begin to hatch and continues through September. 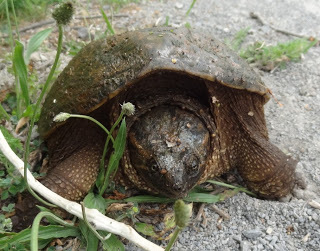 The Dundas Turtle Watch project targets the Snapping Turtle (on Federal lists as a 'species of special concern') and the Blandings Turtle (which is endangered). There may be only a single breeding pair left in Cootes Paradise. This project is organized in close cooperation with the Royal Botanical Gardens (RBG), whose qualified staff provide orientation sessions for the volunteers. All the information gathered is relayed to the RBG and the data is used for educational and research purposes. Full details are here. The Turtles At Risk Study in South Nation, (which received funding from EC's Habitat Stewardship Program), will hellp "better understand turtle distributions and enhance turtle habitat by identifying and mitigating threats through the utilization of inventories, community involvement, and stewardship activities".